You must be a member of the Amsterdam Live Music Lovers Group to attend this activity. Would you like to join this group? New Brewery, opened in Protected content , perfect for a good live music session and an extend menu for home brewed beers and good food. 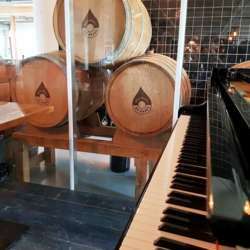 The best musicians from Amsterdam play and sing at this session from 3pm till 6pm. Entrance free. Energetic jazz and cool grooves, hot vocals and exciting solos. Focused on the jazz genre the singers will be singing beautiful songs from the American Songbook. We can stay a bit longer for dinner and around 6pm we can eat something from the menu.